Washington’s estate tax is one of the few progressive revenue sources in our regressive state tax system. Less than 1 percent of residents who pass away are wealthy enough for their estates to be taxed. We can capitalize on recent reductions in the federal estate tax and raise $300 million a biennium in new state revenue to invest in education and other important state services simple by doubling this tax on the top 1 percent of estates. The Trump-led federal tax changes in December 2017 increased the threshold for federal estate taxes from $5.6 million to $11.2 million. With this increase, revenue losses to the federal government total about $10 billion annually. These billions of dollars will now add to the intergenerational transfer of wealth from the top two-tenths of 1 percent of estates to their descendants. From 1942 to 1976, the top marginal federal estate tax rate was 77 percent, with $60,000 of each estate excluded from taxation – the equivalent of $900,000 in 2018. In 1982 and again in 1984, the Reagan Administration and Congress dropped the top marginal rate and raised the exclusion threshold. The decrease in tax rates and increase in exclusion threshold has continued under both Republican and Democratic administrations, so that now $11.2 million is exempt from taxation, and the top rate of taxation is 40 percent. The windfalls to wealthy successors have grown steadily since 2001. 2010 was a particularly profitable year, as there was no federal estate tax whatsoever. This year, the windfall for an estate of $11.2 million, compared to what that estate would have paid in taxes in 2001, is $5.6 million. The decreases in the federal estate tax accelerate the intergenerational transfer of wealth to the already wealthy. In 2016, the top 10 percent of wealthy families received 56 percent of intergenerational transfers, which conservatively make up over 25 percent of their total wealth. This increase in wealth is skewed further when we consider only families with wealth in excess of $2 million. White families are twice as likely to receive any kind of inheritance as Black families, and these inheritances are worth 7.5 times as much as the inheritances within Black families. Median white family wealth for those receiving an inheritance is $287,000. Median wealth for Black families receiving an inheritance is $38,000. Blacks and Latinx make up about 30 percent of the U.S. population, but collectively own about 7 percent of the nation’s private wealth. Social scientists have concluded that inheritances, bequests and other inter-generational transfers account for a large share of the racial wealth gap. Any reduction in estate and inheritance taxes disproportionately benefits wealthy White families over Black and Latinx families, and disproportionately benefits the very wealthy over the vast majority of Americans. Washington State first established an inheritance tax in 1901, with tax rates from 1 percent to 12 percent. For the next 80 years, the Legislature adjusted rates and increased exemption levels. In 1981, Initiative 402 abolished the inheritance tax and enabled the state estate tax. Washington’s current estate tax was enacted in 2005 by the Legislature. It was challenged in 2006 by an initiative for its repeal, but that initiative was defeated with 62 percent of the vote. In 2013, the Legislature passed an increase for estates in excess of $4 million, with the voters again approving. The state estate tax kicks in for estates valued in excess of $2,193,000. The estate tax rates begin at 10 percent, and top out at 20 percent for the value in estates in excess of $11,193,000. For example, an estate worth $5 million pays about $569,000 and one valued at $10 million pays $1.26 million in state estate taxes. Neither of these estates is subject to federal estate taxes. If the state estate tax were doubled, the state would realize on average new revenue of about $161 million annually, with variability depending on the death and assets of wealthy individuals during each year. 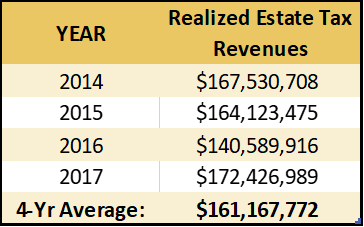 From 2014 through 2017, state estate tax total receipts have ranged from $141 million to $172 million. Total number of estates taxed per year ranged from 484 in 2014 to 333 in 2016. For reference, there were 54,514 deaths in Washington State in 2015. Taxable estates make up less than 1 percent of all deaths. State estate taxes are deductible when determining taxable estates for the federal estate tax. For example, an estate valued at $22,193,000 ($20 million plus $2,193,000, which is the amount of the estate exempted from the state estate tax), with the top marginal state estate tax rate of 40 percent, would reduce the taxable federal estate to $3,633,000. This would both increase Washington revenue from this one estate from $3.7 million to $7.4 million, and also decrease taxes paid to the federal government from $2.9 million to $1.5 million. Increasing the state estate tax rate could result in over $300 million of new revenue for the state of Washington in the upcoming biennium. This revenue could fund early learning, health coverage, or community college tuition, opening new doors of opportunity for state residents and better meeting the needs of our people.